QuickSupport is a tool used by the IT Helpdesk to provide remote computer. TeamViewer is the name of the software we are using to provide QuickSupport. QuickSupport should only be run when you are on the phone with IT Helpdesk support staff. Do not run QuickSupport and allow remote control unless you are on the phone with a staff or student consultant and understand what is being done via remote support. Double-click on the downloaded file to start the QuickSupport software. Remote control is only possible when this application is running. Provide the ID and password to the technician when requested. Close the QuickSupport application to terminate the remote control session. Check out this knowledge base article I found in the Cedar Crest College knowledge base. 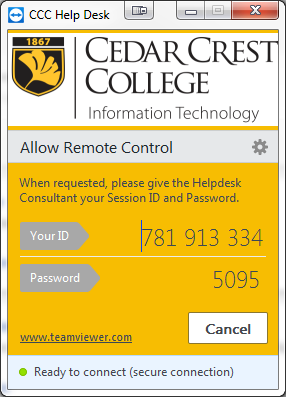 https://cedarcrest.teamdynamix.com/TDClient/KB/ArticleDet?ID=56651 Helpdesk QuickSupport Access Information on using our remote support tool when communicating with the Helpdesk for assistance.